When boiling pasta, remember to salt your water. Whether your pasta is spaghetti, lasagna, fettuccine, tortellini, ravioli, linguini, ziti, penne, or capellini, your water should be as salty as chicken stock. Once boiling, drop in about a pound of spaghetti (or other type of pasta) and it should only take about 8 minutes for your pasta to cook. You want to cook your pasta about 90% of the way for a perfect al dente. Drain your pasta and do NOT rinse your pasta. Why? Because there exists a layer of starch on the pasta that will allow your sauce to cling onto your pasta. When you add your sauce to the cooked pasta, these starches also acts as a thickener to thicken the sauce and adds a bit more flavor to your dish. 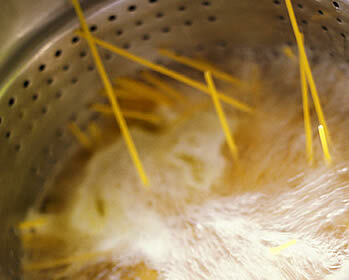 Rinsing your pasta will wash away that vital starch coating and extra flavor.